You know your event is just yuuuuuuge when Meryl freakin' Streep is your headliner. The grande dame of Hollywood graced the stage at the Democratic National Convention on Tuesday night, taking the event from the level of the MTV Movie Awards to the Oscars. 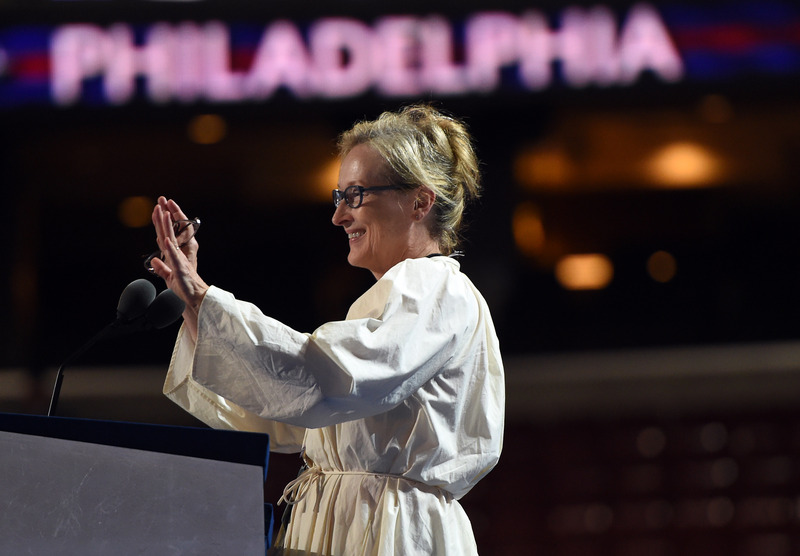 The transcript of Meryl Streep's DNC speech shows that not only is she one of the most important and beloved actresses of all time, but that she also has a powerful political voice. This is hardly Streep's first political rodeo, and her relationship with reigning Democrats is well-documented. In 2012, she introduced Hillary Clinton at the "Women in the World" summit, and professed to the crowd that she and Clinton "have some things in common." In 2012, President Barack Obama awarded her the Presidential Medal of Freedom (and also jokingly professed his love for her), and earlier this summer, she painted her face with a fake tan orange and dressed up as Donald Trump to perform in a faux-Shakspearean satire at a theater gala in Central Park. On Tuesday night, Streep spoke after President Bill Clinton, the potential first gentleman, and was among other stars, including America Ferrera and Lena Dunham, to take the stage. We got some fight left in us, don't we? What does it take to be the first female anything? It takes grit. And it takes grace. Debra Sampson was the first woman to take a bullet for our country. She served, disguised as a man, in George Washington's Continental Army. And she fought to defend a document that didn't fully defend her. "All men are created equal," it read. No mention of women. And when she took a blast in battle to her leg, she was afraid to reveal her secret. So she took out a penknife, she dug out the musket ball, and she sewed herself back up again. That's grit. And grace? Hillary Clinton has taken some fire over 40 years — her fight for families and children. How does she do it? That's what I want to know. Where does she get her grit and her grace? Where do any of our female firsts, our pathbreakers, where do they find their strength? Sandra Day O'Connor. Rosa Parks. Amelia Earhart. Sally Ride. Deborah Sampson. Harriet Tubman. Shirley Chisholm. Madeline Albright. Eleanor Roosevelt. These women share something in common. Capacity of mind, fullness of heart, and a burning passion for their cause. They have forged new paths so that others can follow them, men and women. Generation on generation. That's Hillary. That's America. And tonight, more than 200 years after Debra Samoson fought, and nearly 100 years after women got the vote, you people have made history. And you're gonna make history again in November. Because Hillary Clinton will be our first woman president. And she will be a great president. And she will be the first in a long line of women. And men. Who serve with grit and grace. She'll be the first, but she won't be the last.